These rugged enclosures are manufactured from a UV stable, impact resistant polyamide; cover fixing screws are stainless steel thus ensuring a corrosion-free product. The GHG 411 range comprises a 1,2 and 3 way unit offering a compact footprint. The GHG 432 and 434 ranges are 2 and 4 way units with larger termination area for heavy duty offshore cable. 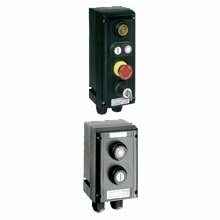 The high ingress protection rating makes this range of control stations suitable for use in harsh environmental conditions. Area Classification Zones 1,2 and safe area. Certified temperature: –55°C to +50°C*.